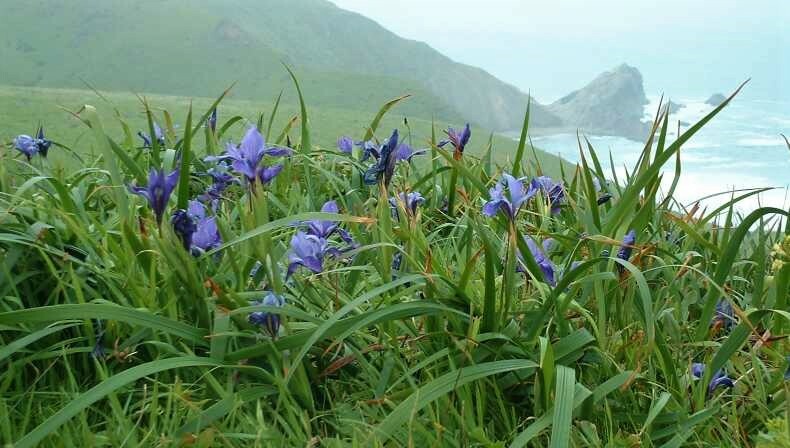 Lovers of California native plants are lucky to have a special native iris. If the tall bearded iris is the queen of the garden, the natives are the pixies. The showy flowers emerge in the spring to add delight to the garden. Members of the Iris family section Californicae, PCN’s are a part of a special beardless iris group, which includes Siberians, Spurias, and Japanese iris. PCN’s have a diverse color range from cream, buff, apricot or golden yellow to orchid, lavender, deep purple‐red, blue violet, and rarely blue and white. The flower structure is arranged in three’s with three falls (sepals that curve downward), three standards (upright petals), and three style crests (protecting the style and the stamens) on top of the falls. Plants will re‐seed and, if you grow several different species, you never know what new colors and flower forms will appear. The falls are patterned with veins of brown, maroon, or red, and often have yellow spots in the throat. The diverse range of color and pattern can exist within a species in the wild or in cultivated hybrids. Called PCN’s for Pacific Coast Natives or PCH’s for Pacific Coast Hybrids, they are distributed along the coast and in the coast ranges from southern Washington to near Santa Barbara. Inland they can be found on the western slopes of the Cascades in Oregon and Washington and the Sierra Nevada in California. In our California gardens, we can grow them with ease. David Douglas is credited with first discovering the PCN’s. Thus, the most widely distributed species was named for him…Iris douglasiana. “Discovered” is not exactly correct because the local native Americans had long been using the strong leave fibers for fish nets and rope. Eventually eleven species and five sub‐species were named. In California, we have 10 species (Iris tenax is found only in Oregon but we do have the Orleans iris (I. tenax ssp. klamathensis). Their drought tolerance is excellent as they are summer dormant. Many people walk right by these iris when they are out of bloom, mistaking their leaves for grass; they are called “grass iris” by some. The species (as opposed to horticultural varieties) iris needs little summer water once established; however, the hybrids do best with regular summer water. PCN’s can be grown for the rock garden, for the front of the native perennial border, for naturalizing in woodland settings, and for growing without summer irrigation under oaks. Their leaves are seldom higher than 18 inches, and the flowers occur from late February to early April on stems which elevate the flowers above the leaves. PCN’s are easy to grow in full sun near the coast; inland they do best in part shade. They prefer well‐drained, slightly acid soil (PH6.5) with humus or compost added. Oak leaves, pine needles, or peat moss are all good soil amendments for improving the acid condition of the soil. They do well with only occasional feeding. They do not need frequent dividing like the bearded iris, and may be left in the ground to slowly increase over the years. If you want to divide or move them, late winter is the best time. Wait until you can see large white new roots forming at the base of the leaves; this shows that they are actively growing. Next, separate them into new plants. As with all new plants, water them until well established. Seeds are easy to grow when started in the fall or early spring, and take about two months to germinate. Thirty days stratification in the refrigerator will help break dormancy, but sowing in flats and leaving them outside in the winter weather will also give good germination. They will bloom in the second season. For this reason, hybridizing can be quite fun, since the results can be seen so quickly. Plants will re‐seed and, if you grow several different species, you never know what new colors and flower forms will appear. My garden is filled with chance seedlings that give a spring surprise when I see the new flower colors. 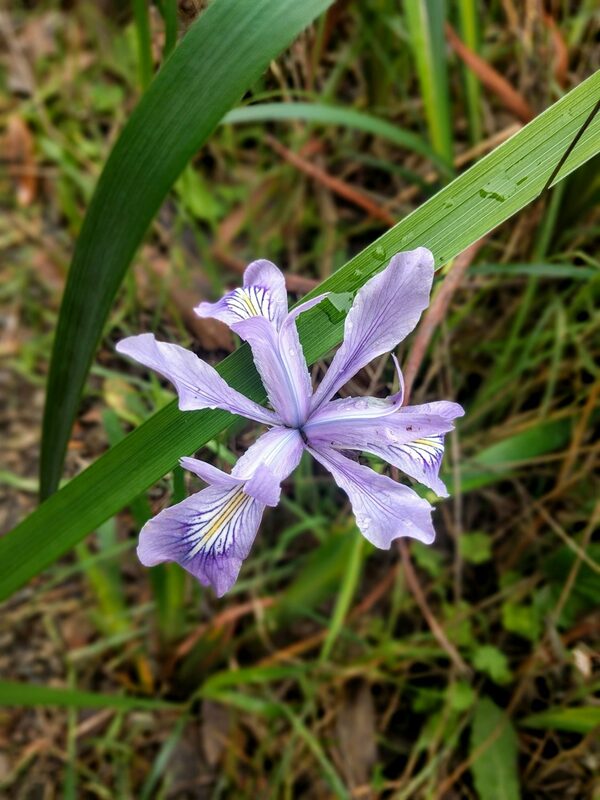 began with Douglas iris (Iris douglasiana) and Del Norte county iris (Iris innominata). The first U.S. hybridizer was Fred DeForest of Oregon who began in 1939 and used long tubed iris (Iris macrosiphon) and Douglas iris. Currently most hybridizing is between existing cultivars and 25 or more new varieties are introduced every year. Modern hybrids are varied in color and shape and most have much larger flowers than their wild relatives. The Society for Pacific Coast Iris has a website with information and beautiful pictures of PCN’s in gardens and in the wild at www.pacificcoastiris.org. There is also membership information. I have been a member and enjoy the seed exchange and the quarterly Almanac. At the Milo Baker Chapter plant sale, we always have over 100 gallon containers of PCN iris available. Liz Parsons has been the chairman of the annual CNPS Milo Baker Plant Sale for over 30 years and has propagated and grown many of the plants for the sale each year. Liz is also a CNPS Fellow, a designation of high distinction bestowed upon CNPS members who have accumulated extraordinary accomplishments towards the understanding, appreciation, and preservation of California native plants.